Lyle: Combining classical music with heavy metal guitar techniques was a signature style of the late Randy Rhoads. From only two recordings with his original band, Quiet Riot, and two with ex-Black Sabbath singer Ozzy Osbourne, Randy reached legendary status in a very short time. In this lesson you'll learn a few of Randy's signature licks and techniques. Lyle: Listen to the lesson licks sample to hear a few of the licks covered in this lesson. Lyle: The palm-muting technique is a key element in the heavy metal style. Using this technique will help you achieve a tighter, more percussive sound. 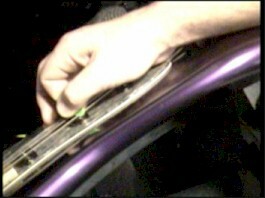 Lyle: Simply rest your picking hand on the bridge and use the heal of your hand to slightly mute the bass strings. Lyle: Here's a video clip showing where to put your hand. Lyle: Hold your pick tightly and while you're muting the string, strike hard with your pick. Lyle: I suggest you angle the pick downward as you pick down and up. Here's another view of how I hold the pick for palm muting. Lyle: Notice in the pictures and video clip how the heal of my hand covers the bridge. Lyle: Here is a palm-muting example at a slow speed. Try to emulate this sound on your own. Lyle: Here's a second example at a faster speed. Lyle: Load this jam track now and try palm-muting the open 5th string (A) using what's called a 16th note rhythm pattern. Lyle: Listen to this sample of me playing along to the jam track. Lyle: Let's add chords to this technique. You'll barre the 3rd and 4th strings at the 2nd, 4th, 5th and 7th frets to produce the power chords - A - B - C - D.
Lyle: Here's a tab and video clip of this lick. Lyle: Palm-mute just the open A (5th) string notes, and then lift up your picking hand to strike the chord. Don't mute the chord, just the open notes on the 5th string. Lyle: Try this lick along to the jam track. Lyle: These chords are built from the A minor scale. You'll be learning licks based from this groove. Lyle: Some of the best licks in rock guitar come from the "blues" scale. Here's a common pattern for the "blues scale in A"
Lyle: The minor blues scale is just like the minor pentatonic scale, but with a flatted 5th added. 1 - b3 - 4 - b5 - 5 - b7. Lyle: Now you'll add a lick to the ending of lick 1. It's a series of pull-offs on the 3rd, 4th and 5th strings. Here's a tab and video clip example at slow speed. Lyle: You'll pick the 4th fret note and pull-off to your 1st finger, then pull-off to the open string. Do this for all three strings notated in the tab. Lyle: Learn this lick and play it over and over until you can play it real fast. you'll need it! Lyle: Here's how you can combine lick 1 with the pull-off lick you just learned. The only difference is at the end of the lick. You'll start the fast pull-off section with a quick little hammer-on. Lyle: Here's the tab and video clip. Lyle: Here's a similar lick higher up the neck. Lyle: After the initial hammer-on and pull-off, palm mute the last 5 notes. Lyle: Here's a tab and video clip of how this lick sounds with the jam track. Lyle: What's happening here in lick 3 is a combination of guitar techniques, the palm muting of a droning string, chords, hammer-on and pull-off technique and a scale run, all in one riff. comp: what sort of effects are you using? paresh: on your voodoo valve? Lyle: You can find another variation of this lick here in our next lick. Try playing this lick in place of the others. Lyle: Fast little pull-offs like these keep your riffs exciting. Lyle: Play lick 4 fast. The example I sent is a slow version. Lyle: Notice that all these licks are still in the same key we started in, A min. Lyle: As you are learning these riffs, try to play along to the looping jam tracks. It is important to play along. This will help you build up your sense of timing and increase your speed with the licks. Lyle: Here's another version of the looping jam track, but this time it has a background guitar in it. Lyle: In the '80s, speed was a big thing for guitar players. It really helped make an aggressive sound. Lyle: You'll need to be fast when executing this next lick. The problem is getting your fretting hand up the neck quick enough to place the lick at the end of the rhythm lick. Lyle: Here's the tab file at a slow speed. Lyle: Here's a video clip of me playing this lick along to the jam track. Lyle: What you should do now is play lick 1 along to the jam track and then add licks 2 through 5 at the end of each pass of lick 1. Here's an audio sample of me playing all the licks in order. Lyle: Now you'll insert licks where you where playing chords. You'll be inserting a "unison bend" with the 2nd and 3rd string. Lyle: Put your 3rd finger on the 3rd string, 12th fret, and your 1st finger on the 2nd string, 10th fret. Then pick both strings at the same time and bend the 3rd string up towards you a whole step so that the pitch of the 3rd string now sounds in tune with the 2nd string. Lyle: This is very complicated on paper but it really isn't that hard. Here's a tab and video clip of this lick. Lyle: Check out lick 6 using this technique. You'll be palm muting the open 5th string the whole time. Lyle: Here's a variation to add to lick 6, this time using the 1st and 2nd strings. 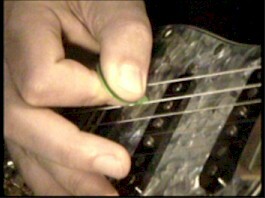 Notice the fret distance has changed between the strings of the unison bend. Lyle: Play licks 6 and 7 back to back with the jam track. Here's an audio sample of what this would sound like. Lyle: Anyone know what kind of guitar RR used during the Ozzy days? Lyle: Thanks for coming everyone!